Los Angeles Union Station main waiting room. It was a perfect opportunity. When I had to go from Los Angeles to Portland, Oregon, it was a chance to for me to experience a new train ride; the historic and celebrated Amtrak Coast Starlight. My one-night journey would depart from Union Station, in downtown Los Angeles. Opened in 1939, Union Station is a resplendent piece of architecture, with travertine marble walls, terra cotta floors and polished wood-beamed ceilings. It’s the largest train station west of the Mississippi. Front entrance at Union Station. Taxi stand is right in front of the entrance. Connecting motor coach transportation is reached through the garden patio. Boarding the Coast Starlight in Los Angeles. My upper level roomette. Very cozy. On the double-decker trains, the roomettes do not have an en suite bathroom. There is one W/C upstairs for the roomette sleeper passengers and several, including two shower rooms, downstairs. Superliner Bedroom has an en suite bathroom and shower. If your budget allows, this is the way to go, especially if it’s on a cross-country, two-night journey. The lower couch pulls out to nearly a double-bed size and there is also an upper bunk. Fresh towels and soap, too. The en suite bathroom. SO convenient! Here’s my short YouTube video tour of the Deluxe Sleeper. It’s the same Superliner, different train. The route of the Coast Starlight hugs the California coastline for hours. Reserved for first-class sleeping car passengers. Settled in, I wander into the refurbished, first-class Pacific Parlour car to meet my fellow passengers. And it was getting close to lunch time, too. Comfortable seating, dining and a walk-up bar. 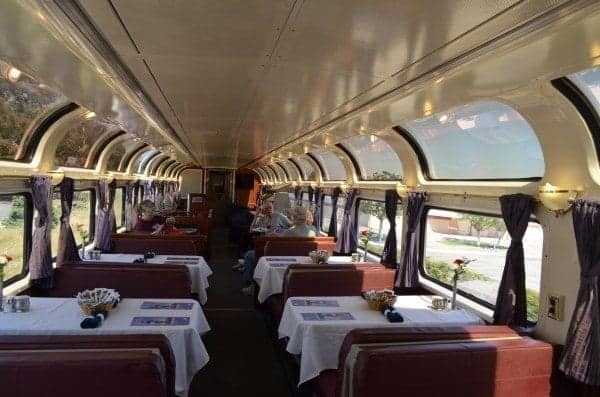 Built in the 1960s, the Pacific Parlour Car is a throwback to the old Sante Fe trains. With cushioned swivel chairs, dining and a full bar with bartender, it’s the focal point of the journey. There are six of these vintage rail cars still in service. Meeting new friends in the Pacific Parlour Car. By mid-afternoon, it’s time for the complimentary wine and cheese tasting. Local California, Oregon and Washington wineries are featured along with artisan cheeses, too. We were presented with a nice selection of regional wines. All totaled, there were four wines to taste, an assortment of cheeses, crackers and even fruit. Still thirsty, the bar is open! Tables are ready for dinner. Afterwards, the bar was open and reservations were taken for dinner. Parlour Car guests could choose to dine in that car or make reservations in the full-car diner, located a short walk from the Parlour Car but with more dining tables available. The view just keeps getting better and better. My ears were popping as the Coast Starlight makes a gradual incline as we get closer to Oregon. Dinner in an hour. You can click the photo for more details. Here’s a peek at the menu for the entire train trip. Observation car for those not in a sleeper. Not that hungry? 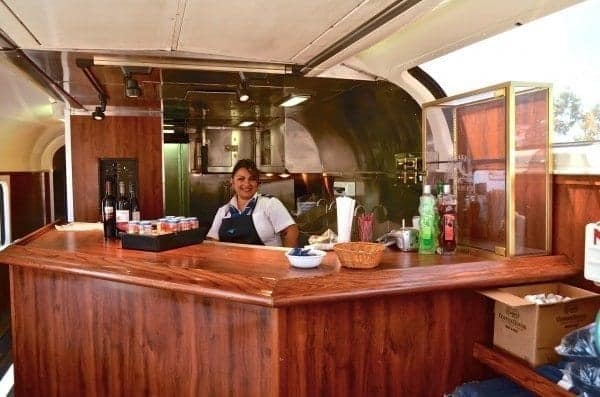 There’s a snack bar below the observation club car, available to all passengers. The snack bar. Open from early morning until midnight. Everyone has a place to relax and enjoy the view or get something to eat, no matter if you are in a coach seat or sleeping compartment. Just enough time to hop off the train and stretch a bit before dinner. The weather is much cooler. Dinner aboard the Coast Starlight in the Parlour Car. Atlantic salmon with rice pilaf and veggies. And wine. Again. Into Oregon now, late spring sunset. Gorgeous scenery to accompany a leisurely dinner. There’s even a movie theater! Still too early to call it a night, I wandered down to the lower level of the Pacific Parlour Car to find a movie theater. This was a total surprise for me. After a few minutes, I climbed back up the steps to the upper level and to my roomette. Time to call it a night, especially since I knew I’d wake up early to look out the window and head back to the Parlour Car for breakfast. Woke up to find snow! First time in two decades to see snow. We were still climbing into the mountains. Early morning sun casts a shadow on the Klamath Falls station. Scenery, scenery and more scenery. Then it was time to mix and mingle. A second wine and cheese party! The second afternoon quickly passed and there was another wine and cheese party! A little less fancy than the previous day’s event, but a welcome diversion nonetheless. Soon, I’d have to gather up my luggage and get ready to leave the train in Vancouver. Washington, not British Columbia, Canada. Turns out that Vancouver, Washington is much closer to the port on the Columbia River than the main station in Portland. Portland, Oregon; another beautifully refurbished Union Station. With a few minutes to spare, and in need of an ATM machine, I hopped off the train and toured the station. There was even a snack shop. One last look at the Pacific Parlor Car. A quick peek at the Vancouver, Washington station. Photo credit: Wikipedia. Five minutes after departing Portland, the Coast Starlight arrived on-time at my station stop in Vancouver, Washington. From here, it was only a 15-minute taxi ride to the Red Lion Inn, for my pre-cruise night before boarding American Cruise Line’s Queen of the West in the morning. Interesting Fact: Amtrak’s Coast Starlight is an historic train route, one that 1930s and 1940’s Hollywood celebrities would ride from Van Nuys to San Luis Obispo, California for a secret getaway to “San Simeon,” William Randolph Heart’s magnificent castle. My journey from Los Angeles to Vancouver, Washington. All told, we traveled 1,200 miles from Los Angeles to Vancouver, Washington in 30 hours. I slept, typed, photographed, wined and dined my way north, rested and ready for my next adventure. For more information, go to Amtrak.com or phone 1-800-USA-RAIL. All photos are mine except for the photo of the Vancouver station. Hi – Amtrak never knows when I’m aboard and I always pay for my own ticket…at least I get a senior discount. Sadly, the movie theater is gone and there’s a fee for the wine tasting. But at least the train is still rolling. Thank you for writing. Sorry to learn of your awful time on the Coast Starlight. These things do happen. Not that it will make any difference now but there are times on Europe river cruises where the entire cruise becomes a bus trip during the day. People fly over and spend a fortune and there’s no full refund. Unfortunately, things happen *(you didn’t mention what caused your train to fail…tracks, mechanical, accident) but it sure is a pain when it does. Just like with other forms of travel, (cruise, air or tour) it’s necessary to write a letter to request a refund. Yet another hurdle for the inconvenience. Cruise ships have issues too from weather and they miss ports or change itineraries and people are aggravated but there’s nothing to be done about these things. I hope next time you ride Amtrak, things go much better. Happy Belated Birthday, too. Thank you for your note. Hello, so I made a special trip with my sister to celebrate my 30th birthday. We planned on taking the starlight coastal via Amtrack from Los Angeles to Seattle. Unfortunately, we were bussed after only about 10 hr of a train ride. I live in Florida and only flew to L.A. for this particular train ride. And for my 1st time with Amtrak I am not impressed. I couldn’t get a refund for train rides without having to send an email detailing my frustration that I flew across the country to experience this site seeing ride. To be bused more than half my trip. There was no scenic route but the back of crowded bus. Not only were we bused once but once we got to the next Amtrak station we were dropped off in Eugene, Or not knowing where we were, cross country, tons of strangers, and finally were told yet another bus was scheduled not waiting but schedule and hour and half later to come get us. We were given food vouchers to walk 2 blocks with all of our luggage to eat at a crowded restaurant where everyone who was dumped with us were trying to cash in. And we my sister and 2 other passengers went to another restaurant just to eat and try to charge our devices since there were no places to charge them on a cramped bus. I do understand environmental things happen which can delay or cancel plans but only offering a $75 voucher to return to a train ride within a years is an insult. I would appreciate it if we could get a refund for the scenic train ride that we didn’t get. My friend and I just finished a very long and large loop across from Chicago to Portland, from Portland to San Diego and from San Diego back to Chicago. The sleeping was horrendous. The beds were very uncomfortable especially the bunk above. The same food menus work on each and every train with no exception. The only vegetables that were offered was cold wax green beans. There was no wine and cheese tasting. There was no movie theater on the lower level it had been discontinued in order to have Wi-Fi we were told. The ride most of the time was extremely bumpy which made it difficult to sleep. Most of the staff however were very kind and fun to be around. We enjoyed playing cards and meeting some of the guests. There needs to be a handle installed to help get up into and get out of the upper bunks. If you don’t need a lot of sleep this way of travel is good but certainly not the fastest way to get there. The schedule did not allow for seeing the American Rockies. We went through there at night unfortunately. The roomette is okay if there will only be one person staying in it. It is definitely not big enough for two people and the person on top in the bunk will be very uncomfortable . We also changed to a sleeper and the sleeping in the bunk was still uncomfortable. There was no room for our bags in the roomette but there was in the sleeper. We were also told we had to take an Amtrak Thruway bus from San Diego to Vegas and then another one from Vegas to Salt Lake in order to catch the train again to go from Salt Lake to Chicago. Both of these buses were the worst part of our trip. Greyhound employees we’re difficult and on both occasions gave us the wrong information about which bus to get on. I will never take Greyhound again. The employees were slow and very uncaring. The buses were dirty and the bathrooms in them were horrible. These buses were definitely not Amtrak only buses. In summary, we enjoyed being able to look out the windows and see what we could see. The sleeping was horrendous. The food was good at the beginning but the same menu day after day was not good. Hi Mike, that’s awful news to hear. I heard a rumor that the price had increased (it was free all three times I was there) but to lose the cheese and crackers, too, is sad. I guess if you know and can plan ahead of time, BYOC&C! Thanks for the update. Wine tasting now cost $7.50 for three small pours and no cheese and crackers. We took this train from Portland to San Francisco the summer of 2014 and the cheese and wine tasting had been discontinued – hope it’s back to stay. The Coast Star Light looks very good, but my wife and I are interested in something more extensive, perhaps with stay-overs at cities along the way, touring some of the wine areas and the like – something that would take at least a week and preferably 10-14 days. Any ideas, recommendations, etc. will be greatly appreciated. Thanks so much. You are right…there’s nothing quite like train travel. I’m glad it’s gaining popularity again! Brilliant article Sherry. And oh-so stunning pics. Yes, it is still available to passengers who book a sleeping compartment.